Rabbi Achiad Ettinger, critically wounded in Sunday’s shooting attack at the Ariel Junction in Samaria passed away this morning. (Monday). Ettinger, 47 from the community of Eli in Samaria, was the father of 12 children. He headed a yeshiva in south Tel Aviv, known to be a difficult neighborhood. An investigation of the moments of the attack shows that Ettinger drove through the junction, but then noticed that there was an attack and turned his car around. He drew his weapon and fired four shots at the terrorist when he was struck by the terrorist’s bullets that killed him. The family thanked the staff at the Beilinson Hospital, the MDA teams and the Samaria security division, and all the people of Israel who prayed for his recovery. 19-year-old IDF soldier Staff Sgt. 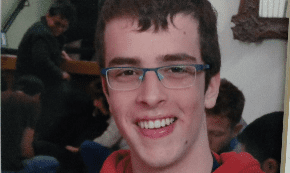 Gal Keidan was also killed in the attack when a terrorist stabbed him. It was the first of two attacks carried out by the terrorist. Another soldier was severely injured when the terrorist shot him at the nearby Gitai Avishar Junction during the second phase of the attack. He is still in serious condition. The terrorist, Omar Abu Laili, is still at large and the IDF is conducting a broad manhunt for him. “Heart-breaking news,” stated Israeli President Reuven Rivlin. “Rabbi Ettinger’s life’s work will continue and be among us even after his passing, and the strength he gave his pupils and the community he led will continue to strengthen us through the enormous grief and sorrow,” Rivlin added.